The visitors' experience begins in Hangar 37, a 42,000 square foot former seaplane hangar that survived the December 7, 1941 attack. Transportation to Ford Island is via shuttle buses. After arrival in the Pacific Aviation Museums' lobby, guests enter a 200-seat theater where they view a 12 minute movie covering the surprise attack on Pearl Harbor, including historic footage. Leaving the theater visitors enter a corridor that sets the stage with sound effects and photos of what life was like in the Islands before 1941. Upon entering the exhibit area of 25,000 square feet, visitors first see an authentic Japanese Zero in a diorama setting on the deck of the Japanese carrier Hiryu at dawn on December 7th. Also in the hangar is a light civilian plane that was airborne and shot during the Oahu attack, together with a P-40 fighter of the type airborne from Wheeler and Haleiwa Field on the fateful day. Visitors will then be enthralled with an exhibit relating a story, both before and after, of one of the Japanese Zeros that crash landed on the island of Niʻihau. The year 1942 was one of “desperate courage.” Exhibits include an actual B-25B Mitchell similar to one used in the Doolittle Raid on Japan in April,1942. An SBD Dauntless dive bomber is the centerpiece in our retelling of the Battle of Midway. An authentic F4F Wildcat is featured in the Guadalcanal diorama as the story of the “Cactus Air Force” is told. Finally, the story of America's mobilization for war – manufacturing airplanes and training pilots in particular – is told using the actual Stearman N2S-3 in which former President George H.W.Bush soloed. Visitors then have the opportunity to become a WWII pilot in one of the museum's interactive Combat Flight Simulators. Fly planes off a runway take off and land on an aircraft carrier and dog fight with the enemy. Enjoy a delicious meal in the museum's restaurant, the Laniākea Cafe. 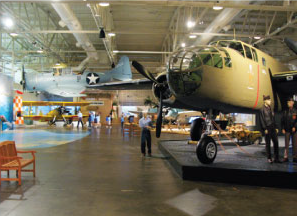 The Museum Store features “everything to do with aviation” and Pearl Harbor.